Last month, Google bought a mobile social network. The latest Google acquisition is Jaiku, "an activity stream and presence sharing service that works from the Web and mobile phones". It's similar to Twitter, the service that made the concept of microblogging successful, but Jaiku also lets you add feeds from other sites and mix them with your messages. Like in Twitter, you can add a list of contacts and see an overview of their latest updates. You can post messages from the web, by SMS or using a mobile application for Nokia S60 phones. ReadWriteWeb thinks that Google preferred Jaiku to Twitter because it "may be stronger on the mobile platform than Twitter and probably came at a much lower price". It's worth noting that Twitter was started by Evan Williams, co-founder of Blogger and a former Googler. Other former Google employees launched FriendFeed, a service that merged the feeds from sites that broadcast your online activities. 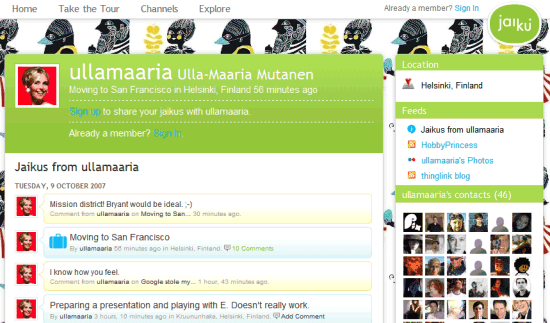 Jaiku is a combination between Twitter and FriendFeed. Jaiku creates a lifestream by joining timestamped bits of content that define your life. "Every time I ping Twitter, the message is time stamped. Every time I post a link to Del.icio.us, that's time stamped. Every time I upload a picture to Flickr, a time stamp of when the picture was taken is also sent. Whenever I listen to a song on iTunes, the track information is sent to Last.fm with a time stamp. (...) Just about every time somebody publishes something on the Web, it gets time stamped. Wouldn't it be nice to pull in all these disparate bits of time stamped information and build up a timeline of online activity?" wrote Jeremy Keith in November 2006, defining the concept of lifestream. "Technology has made staying in touch with your friends and family both easier and harder: living a fast-paced, on-the-go lifestyle is easier (and a lot of fun), but it's more difficult to keep track of everyone when they're running around at warp speed. That's why we're excited to announce that we've acquired Jaiku, a company that's been hard at work developing useful and innovative applications for staying in touch with the people you care about most -- regardless of whether you're at a computer or on a mobile phone," explains Google the decision. The service could be a part of Google's mobile plans and one of the features included in the Google Phone. It could also be integrated in Google's social project that intends to produce activity streams and build a social network around Gmail and the rest of Google's communication apps. This is really a great scoop! Do we see a pattern coming out here? Could all these services BE the Google Phone? Here are mine about lifestreaming. microblogging, twitter, facebook status updates... jesus, you have to give people a chance to miss you!